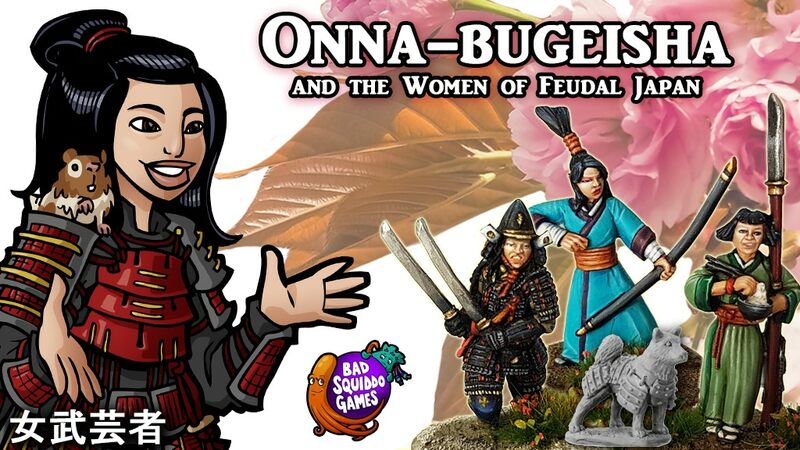 Der aktuelle Kickstarter von Bad Squiddo Games geht auf die Zielgerade! 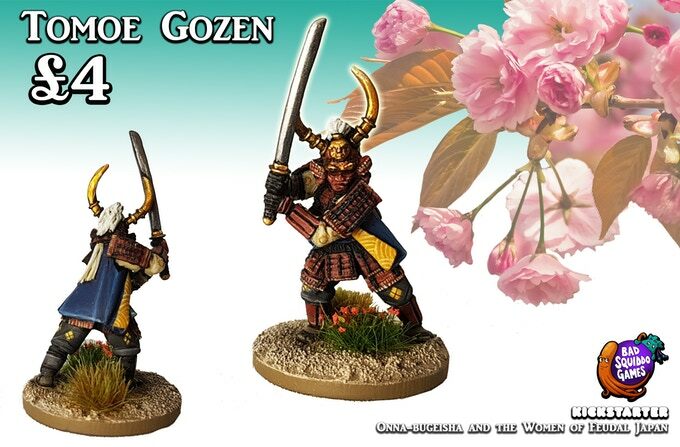 A short and sharp Kickstarter to get these beautiful miniatures on your tabletop as soon as possible. 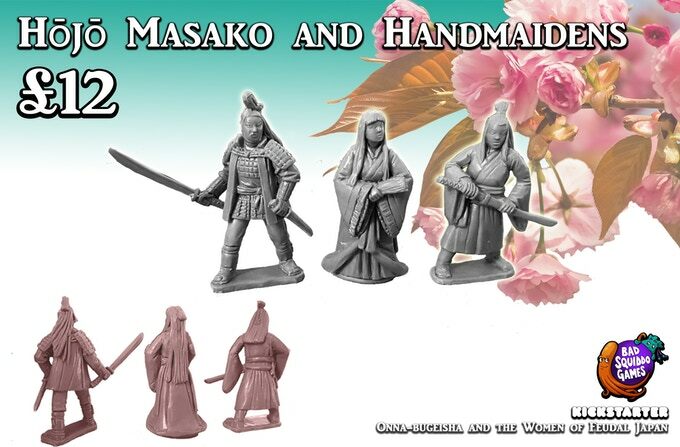 The sculpts are finished, they’ve been master cast and quality approved. We just need that boost to get them into production. 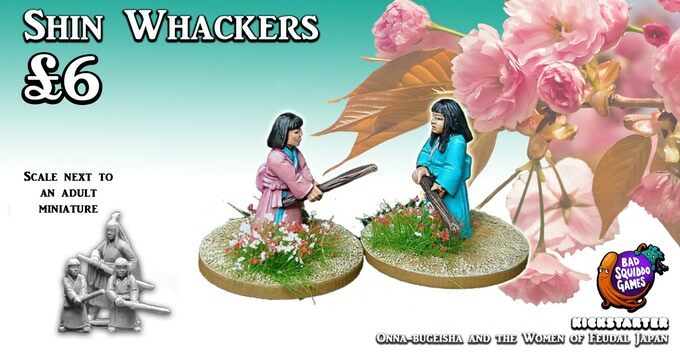 We specialise in 28mm female miniatures and giving nods especially to women in warfare from the past who may not have received the recognition they deserve. 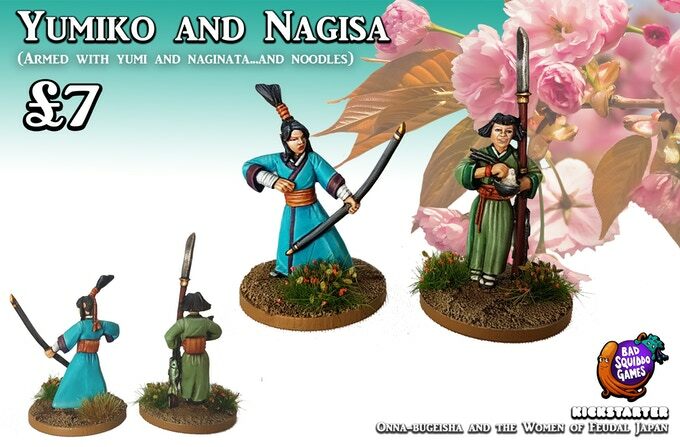 This is by no means a comprehensive list but so long as the Kickstarter goes well there will be another wave…then another wave…and.. you get the idea! 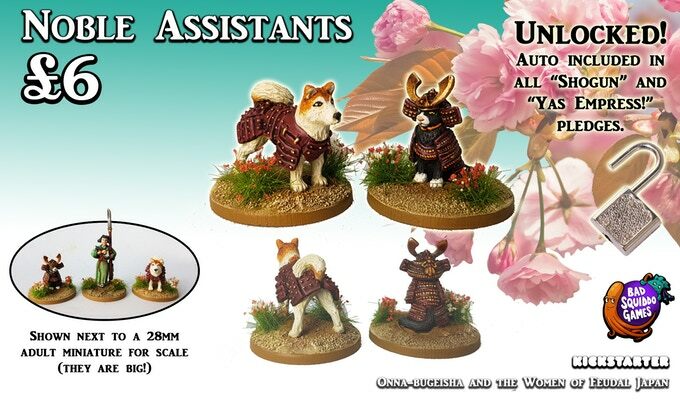 And following Bad Squiddo tradition – yes we have some adorable critters! 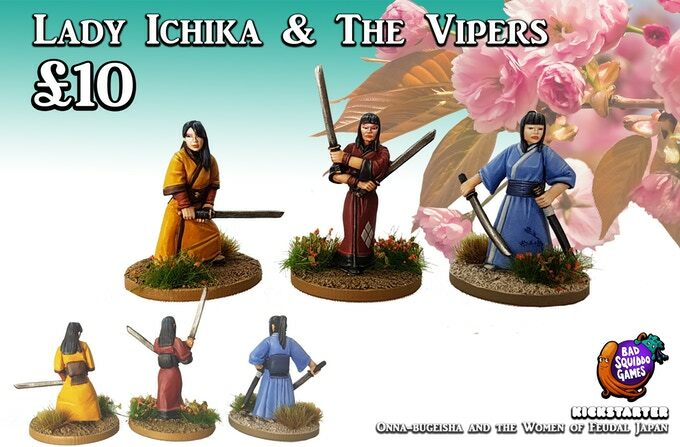 All pledges do not include shipping, though it is very reasonable (see further down the page). The levels are very simple, the top two are basically „everything“ and „everything plus the previous stuff“, and Pick and Mix lets you choose exactly the packs you want if you don’t want it all. 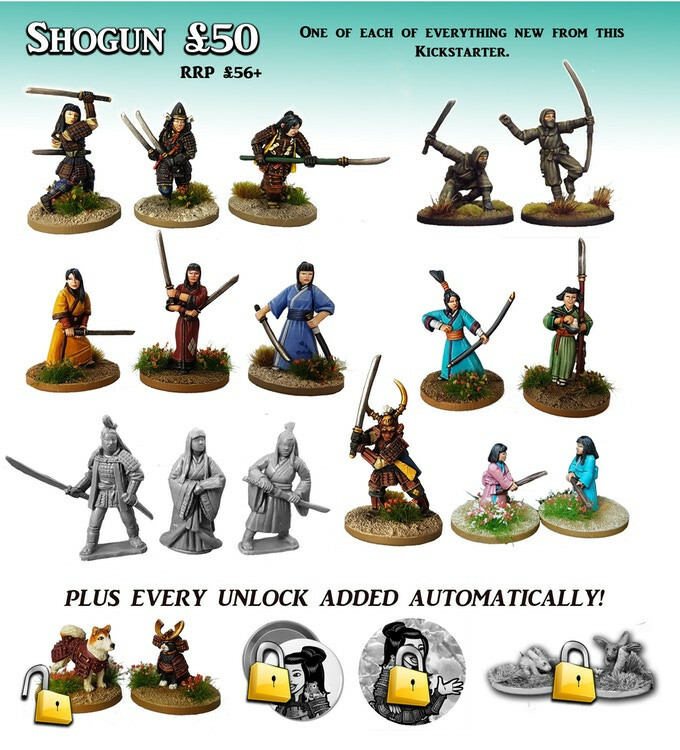 As add ons get unlocked, the RRP value of the „Shogun“ and „Yas Empress!“ pledge levels get bigger, making it a better deal as we go along and smash fresh stretch goals! 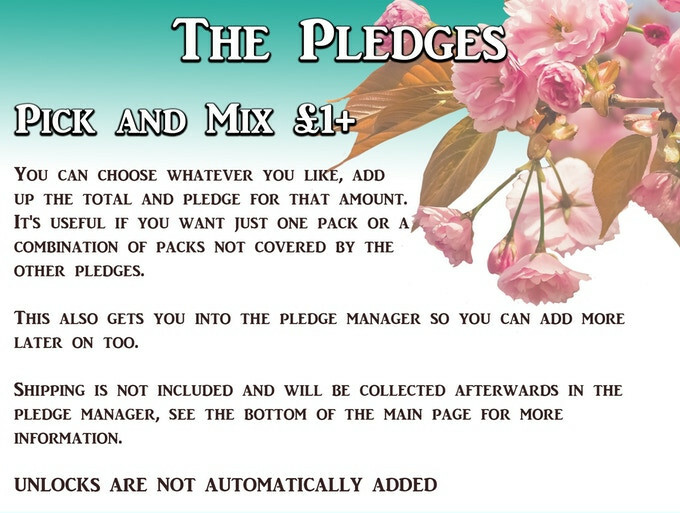 You may add as many of the packs from the campaign to your pledge as you wish, this will be sorted afterwards in the pledge manager, so just make a note and adjust the pledge amount accordingly. E.g. 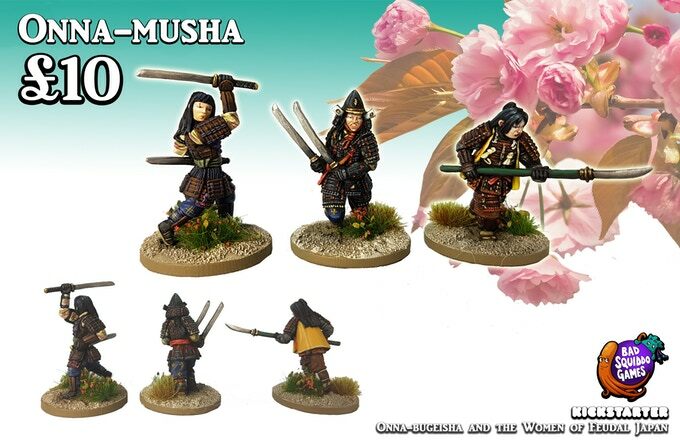 if you want another pack of Onna-musha to go with your Shogun pledge, make your pledge £60. 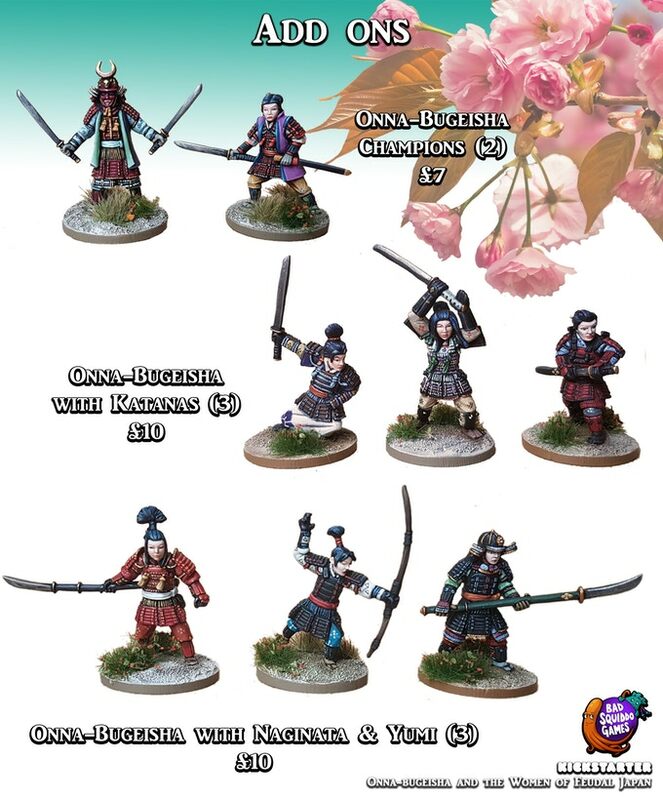 You may also add these beautiful Onna-bugeisha from our previous release, they fit perfectly with the new ones (same sculptor) and are just as amazing. 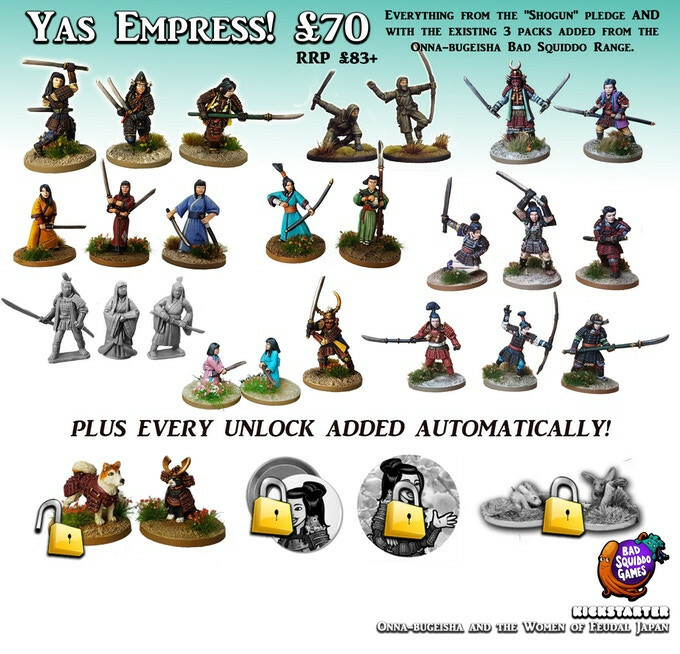 If you want them all, it might be worth looking at the „Yas Empress!“ pledge which gets you ABSOLUTELY EVERYTHING for the best price. Die Kampagne endet in 5 Tagen und ist bereits finanziert. Schöne Ideen dabei aber die Miniaturen entsprechen einfach nicht einem heutigen Standard, den ich erwarten würde. Selbst die mittlerweile doch auch in die Jahre gekommenen Perrys Modelle sehen deutlich besser aus. 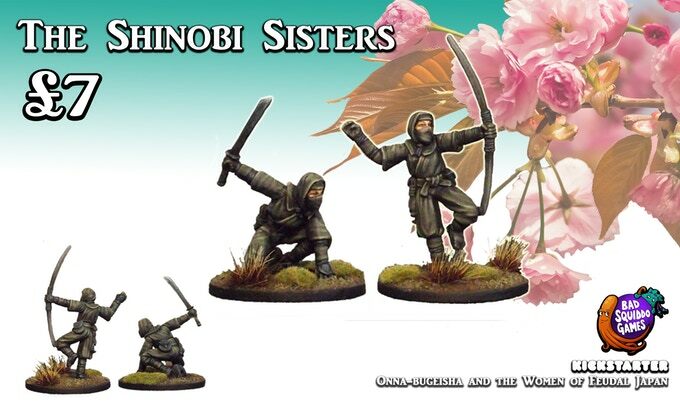 Lediglich die Ninjas sind zum Aufstocken brauchbar. Lady Ichika(?) + Anhang finde ich wirklich sehr gut, besonders die Blaue und die Gelbe. Die haben wirklich schöne Gesichter und Proportionen.